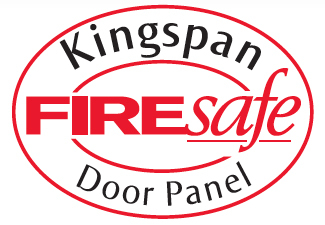 Kingspan Ecosafe insulated panels use an environmentally sustainable Firesafe PIR insulation core. Kingspan Ecosafe insulated panels are the result of extensive research and development work to provide an optimised and sustainable solution for our customers. Kingspan Ecosafe insulated panels have a low GWP (Global Warming Potential <5). The Kingspan panel consists of 40mm or 80mm thick HFC, CFC and HCFC free polyisocyanurate (PIR) expanded foam insulation, sandwiched between two sheets of high strength galvanised steel. The closed cell PIR foam matrix auto adhesively bonds to the impermeable outer skins, preventing water absorption and providing long term thermal performance and reliability. 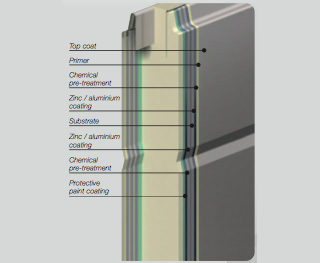 The panel outer skin consists of 0.45mm continuous hot dip, zinc- coated structural steel (95% zinc, 5% aluminium). From concept and design to manufacture, Kingspan Door Components are committed to advancing technology. ThermAdor Industrial’s polyisocyanurate foam core, which is unique to Kingspan, is self-extinguishing and more difficult to ignite than other types of insulated panel. The chemical formulation is the same as Kingspan’s Roof and Wall panel which meets LPS 1181 and FM 4880 insurance approval standards and is fully certified to EN 13501 Fire Classification of Construction Products and Building Elements. In addition to its superior thermal performance, ThermAdor Industrial provides outstanding weatherproofing. Wind Resistance EN 12424 – Test Result Class 5 (>1000Pa) Tested door withstood air pressure up to 1520Pa, equivalent to 180km/hr winds. Class 5 is the maximum rating achievable and is described as ‘exceptional’ performance. Resistance to Water Penetration EN 12425 – Test Result Class 3 (>50Pa) Tested door withstood leakage up to 130Pa. Class 3 is the maximum rating achievable for resistance to water penetration. Air Permeability EN 12426 – Test Result Class 3 (<6m3/m2.hr.) 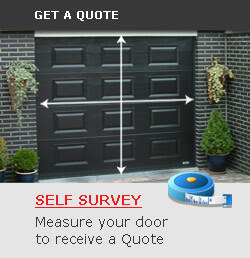 Tested door leakage at 50Pa positive pressure = 4.3m3/m2.hr. The maximum air permeability allowable, in terms of building regulations, is 10m3/m2.hr. ThermAdor Industrial’s reduced air permeability (i.e. a high level of air tightness) serves to further reduce carbon emissions and is a cost-effective means of improving the energy efficiency of a building. ThermAdor Industrial has been tested to the highest safety standards and incorporates the most advanced safety features available. Fully Compliant with Standards ThermAdor Industrial is CE marked and meets the requirements for conformity with the Construction Products Directive. Cable Break and Spring Break Devices In the event of a cable snapping or a spring breaking, the safety devices will activate and prevent the door from falling. Protection Against Finger Trapping Doors under 2500mm high are supplied with ‘FingerSafe’ anti-pinch panel in compliance with European Standard EN 12604. ￼ThermAdor Industrial has undergone rigorous independent testing by SP Swedish National Testing & Research Institute so you can be confident that it fully complies with current legislation. But don’t just take our word for it… ask for a copy of our test report. We’re proud of our results! It’s our commitment to high quality that make us first choice with architects, contractors and developers. For more information on the regulations in relation to industrial doors, ask about our CPD seminars which are approved by The Royal Institute of the Architects of Ireland (RIAI).